Bring probe card support into your own facility with Wentworth’s probe card manufacturing equipment. The Compass test station is a high precision tool for maintenance, repair and test of blade or epoxy probe cards. Productivity-boosting Compass technology enables operators to check and adjust probe alignment and planarity, plus exercise, clean and accurately check the resistance of the probe tips. 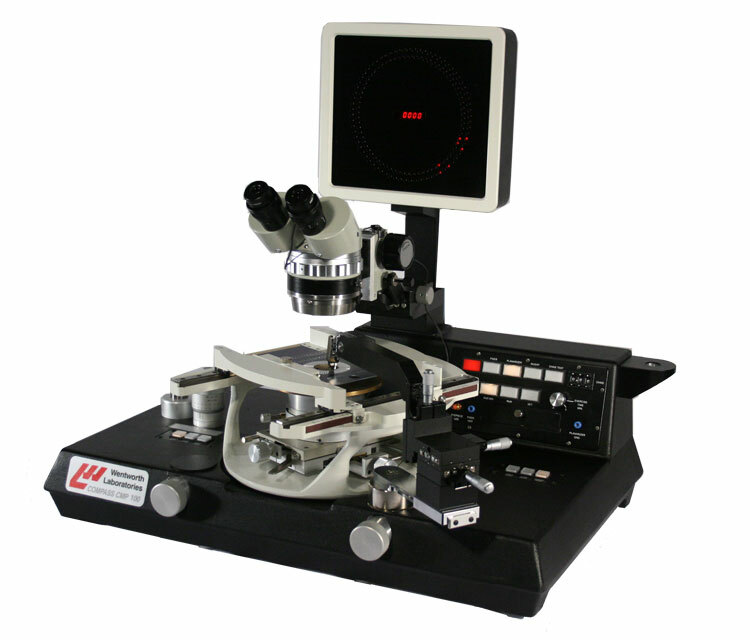 Features include up to 288 channel LED light box planarizer with digital read-out, 6 inch chuck with 2 inch XY stage, chuck with ceramic pad for probe cleaning, 360° rotating 6” wafer chuck and probe card holder with position lock and exercise function used to simulate the use of the probe card repair under operating conditions. The Compass Test Station is purpose built for the build, maintenance and test of blade or epoxy cantilever probe cards. The operator can simulate probe card use by using the exercising feature and can easily align, planarize, measure resistivity and replace probes. The Compass supports the full build of Blade probe cards using Wentworth supplied Blade needles, to achieve this the Compass comes with a gripper arm which can be mounted on right or left of station. This arm supports the blade needle during the positioning and soldering processes.